The room is lovely and quaint but didn’t realise it was on the main road so a bit noisy for our tastes. Pleasant Experience, Wonderful Staff Friendliest hotel staff I have ever had the pleasure of staying with. The place itself was lovely and clean and such a tranquil spot. Beautiful place to stay with the geese. Only bad part about it was that I wish I was there longer. We have plans to be back again. The location was great - right in the middle of the town. 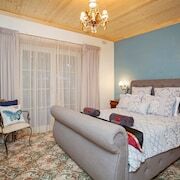 The room had a lovely feeling with the exposed ceiling beams, made it feel like it was very spacious and European feel. We unfortunately had the room next to the reception, so it was a little bit noisy during reception opening hours. Great for a romantic getaway. 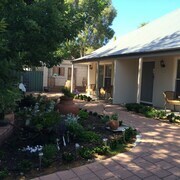 Enjoyable weekend, nice clean room and plenty to do in hahndorf. 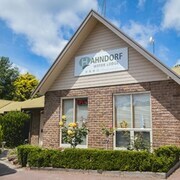 If you've ever scanned your mates' social media and thought your life was boring, get some payback with a stay in Hahndorf. Situated 25 kilometres from the centre of Adelaide, it's a fantastic place to base yourself while exploring South Australia's capital. If you're up for seeing some unforgettable sights, Adelaide has got what you need. Start your exploring at well-known attractions like the National Wine Centre of Australia, the Adelaide Botanic Gardens and the Art Gallery of South Australia. If you're looking to kill a few hours, take in the exhibits at Hahndorf Academy & Heritage Museum. 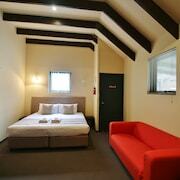 If you're hoping to stay nearby, try the Haus Studio Apartments and Amble at Hahndorf. The expert vintners at Hahndorf Hill Winery are ready to tell you what's special about their winemaking style. Make sure you have a few samples before purchasing a bottle to take home. 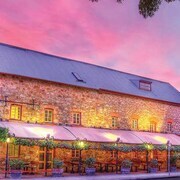 If you want to stay near this sight, see what's on offer at the Manna Of Hahndorf and Hahndorf Motor Lodge. There isn't anything wrong with spending a little extra on holiday. Let 'future' you deal with budget while 'holiday' you gets familiar with the minibar. 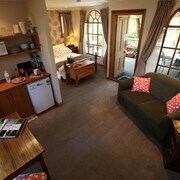 The Hahndorf Oak Tree Cottages is our recommended upmarket choice. Are you one of those people who loves the nightlife? Or is the cafe culture more your cup of tea? Whatever toasts your bagel, we've got your sorted. Those who feel like a glass of vino or a couple of beers should wait until wine o'clock then head over to The Haus Hahndorf. If you wake up with a heavy head, grab your sunnies and follow the smell of roasting coffee beans to 5 FUSION. 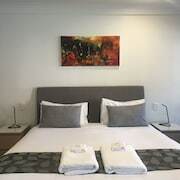 Having trouble securing the ideal Hahndorf hotel deal? Don't tear your hair out — there are heaps of options to choose from in Balhannah and Littlehampton. So, get your skates on! 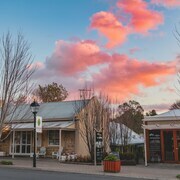 It's time to pick out your perfect Hahndorf experiences, accommodations and flights. And don't forget to tag us in all of your awesome #TravelEnvy moments!